The USAHEC recently installed a new exhibit in the hallway connecting the Visitor and Education Center and Ridgway Hall. 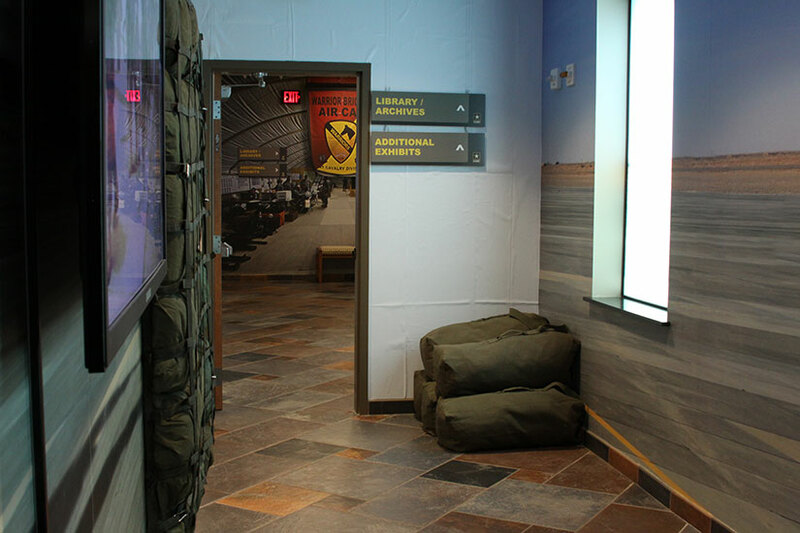 This immersive experience is designed to be a touch-point for current Soldiers and veterans who served in Iraq and Afghanistan, as well as to enlighten the general public. Visitors will see what appears to be a portal in the hallway and as they enter, they will note they are in a portion of a military cargo plane. As they exit the "aircraft", they will hear the sounds of military aircraft and see on both sides, expansive photos of the tarmac and images of Soldiers proceeding from the planes with their gear. Soldier cutouts add depth to the display, while a video monitor displays rotating images of Soldiers arriving in theater. Proceeding through the hallway, visitors will notice the sky over the Middle East above them, and further down the corridor, see a display of gear as it was stowed. 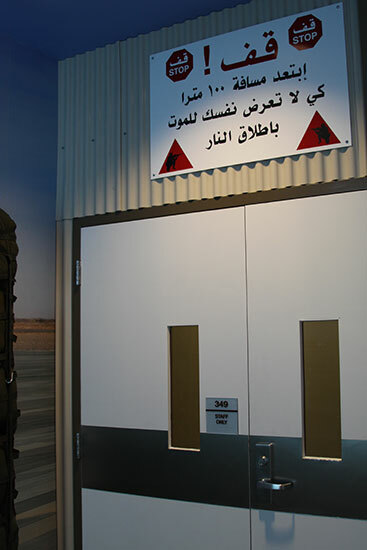 To the left, visitors will see a warning sign on the door (in Arabic) that tells them they cannot enter. 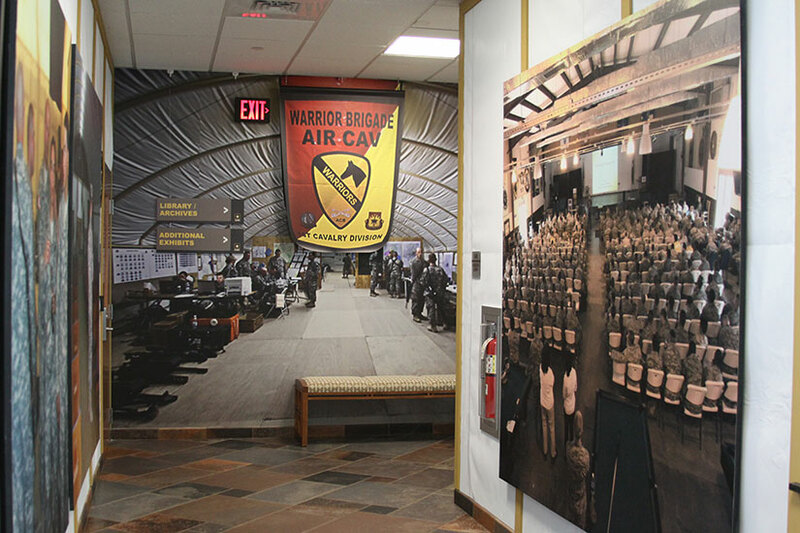 Moving through a small doorway, visitors enter the second portion of the exhibit and can hear Soldiers voices, while seeing images of Soldiers speaking to each other and receiving briefings. 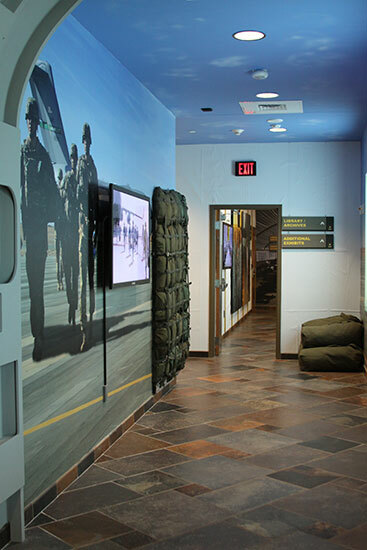 A wall mounted video monitor shows images of Soldiers receiving orders or waiting to be briefed, while an existing window with an inserted graphic of the desert reminds visitors of where they are. At the end of the hall visitors see a large wall graphic that creates the optical illusion of a much larger space.